The Race start, finish and the pre- and post-event activities take place on the west side of Balboa Park. The start line is on 6th Avenue at Palm and the finish line is on Balboa Drive south of Quince. The pre- and post-event activities take place on the grassy area along 6th Avenue between Laurel and Quince. Click here for a map. Important Note: The Race starts promptly at 8 a.m. - late starters will not be allowed on the course. April 27 to May 20- THE LOWEST PRICES OF THE YEAR! Sleep in for the Cure $40 Support Komen San Diego from home by registering for Sleep In for the Cure and your T-shirt, bib and door hanger will be mailed to you before the Race. You must register by 10/23/16, so we can ship it out in time. Timing Chip – $10 Receive an official time and be eligible for age group awards for the 5K only. Online registration will close at midnight on Wednesday, November 2 so that our Race team can get everything together for the Race. Support Komen San Diego from home by registering for Sleep In for the Cure and your T-shirt, bib and door hanger will be mailed to you before the Race. You must register by 10/23/16, so we can ship it out in time. New and returning volunteers are encouraged to get involved. All volunteers will receive a unique Race volunteer t-shirt! Click here to get registered as a volunteer. Our Survivor's Celebration begins by the main stage at 7:30 a.m. Don't miss this very special celebration featuring our inspirational annual survivor parade, Honorary Survivor ceremony and entertainment. Emotional. Memorable. Motivational. I AM THE CURE is Komen's new rallying cry encouraging women and men to take an active role in their breast health. The program speaks to the importance of early detection -- the best defense against breast cancer -- and provides simple, action-oriented messages that Race participants can take home and put into practice. Listen for the cheers as you walk or run and JOIN IN! Questions about the Race for the Cure, 5k? 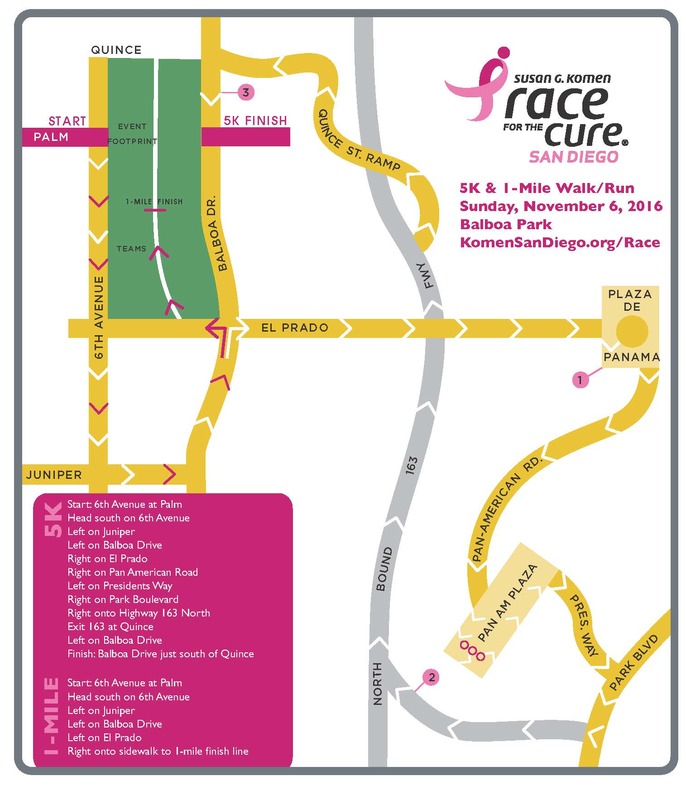 Please contact our Race Headquarters, In Motion Events, at (760) 692-2900 or via email at race@sdkomen.org.